Students - Yesterday, as I watched Jerry Ward carve this bust of Don Quixote, I was transported to a new place inside of myself. A man appeared from inside of a tree trunk, and it was magical! 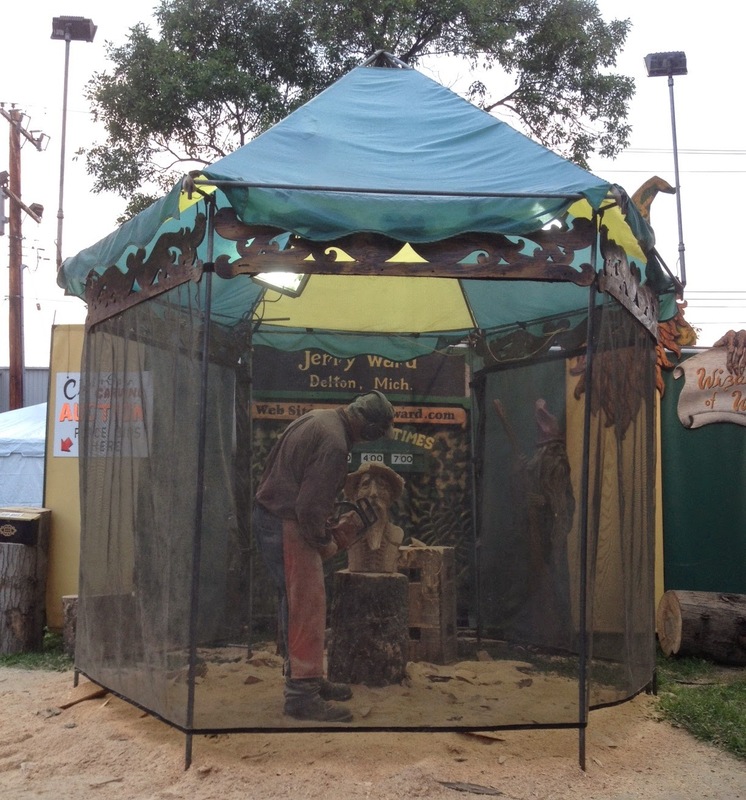 Sawdust smells tickled my nose, and I sat mesmerized by this chainsaw artist. I knew that I would write a poem about my feeling because some moments in our lives just call out to us, "I am a poem! I am a poem!" and this was one of them. 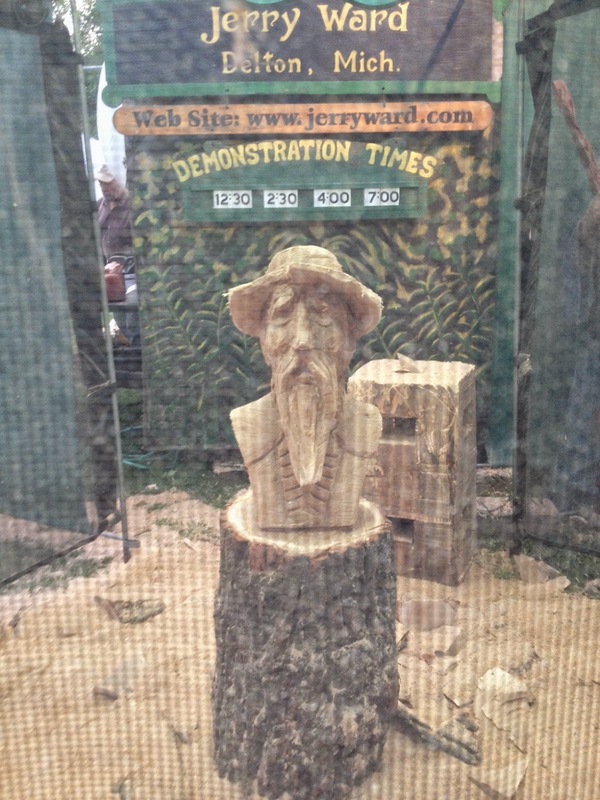 After Jerry finished carving the bust, he turned to the audience - sitting on big logs - and told us that he releases figures from wood. When I began to write, this Don Quixote came to life in my poem, happy to be free after many so many years. 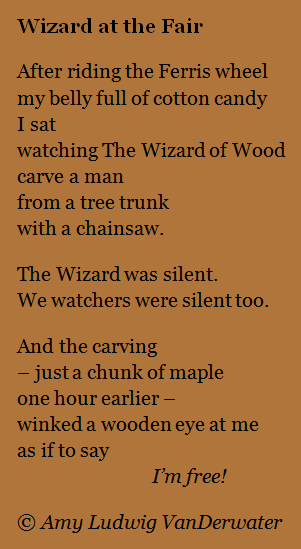 My first draft of today's free verse poem was in the present tense: "I sit/watching/the Wizard of Wood..." But as I wrote, I realized that poem would work better in the past tense. Sometimes when people think about their memories, they think about years and long ago. But memories are falling around us like twinkling raindrops...every single minute. You can take something that happened to you today - and write about it in the past tense voice, as if it happened long before. What has happened to you today already? What might happen in the next few hours? If you live your life paying attention to everything, you will see how a now-happening might just be a poem in the making. Open your eyes! Open your ears! What do you find? To see more of Jerry Ward's artwork, visit his website here and read about how "Wood is mystical." Mary Lee is hosting this week's Poetry Friday roundup over at A Year of Reading. Do not miss the poem she shares with us today. You, too, might "snort your morning tea!" "winked a wooden eye at me" love that! I've always been amazed the way artists can make an image come alive from wood, clay, stone... What a gift to be able to create something so wonderful! I've seen this done, too, Amy & the carvers show such talent. Wonderful that you saw it happen, and then wrote about it. I see what you mean about the tense-works well when telling a memory. This poem is positively magical. Thanks for sharing it here. Amy, your poem captured my attention and I wanted to learn more about the Wizard of Wood. When I went to his website, I found two videos showing the process that you most likely saw. I was mesmerized as I am sure you were as evidenced by your poem. Thank you for noting that freedom is the result of the carving as is the Wizard's intent. Great to see a new post from you. I love the way the wooden carving seemed to come to life. Thanks for sharing that your poem changed from present tense to past. I understand your reasoning for doing that.